Marisa Olson, speaking on the internet as an aesthetic and vehicle for art. Holly Herndon, speaking about the internet as a sonic space and a reflection on how the internet has brought about a trans-human wherein we exist and live increasingly online. Owen Hindley, speaking on New Technology and The Internet as a tool for Music Composition. 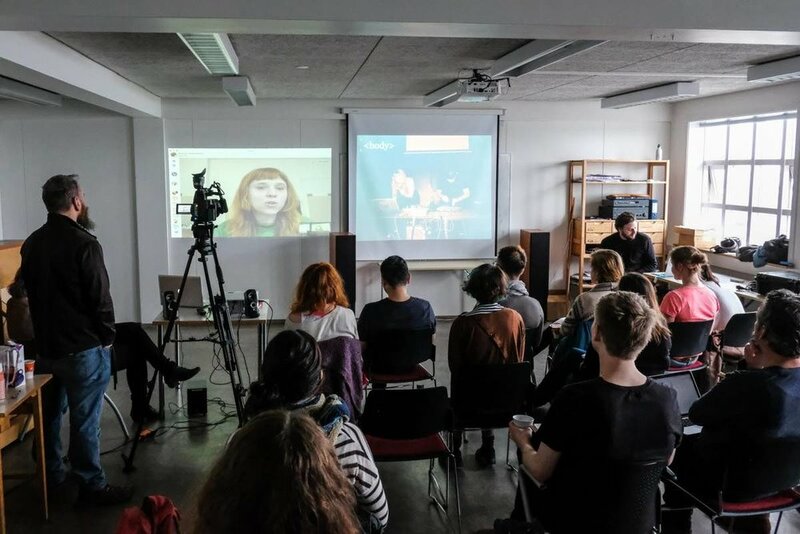 Furthermore, one student from IUA’s Theatre and Performance Making, Lóa Björk Björnsdóttir gave a live presentation where she spoke on Memes as Art, Specifically in Relation to its Feminist Political Capacity. The disappearing of individual artists and tendencies towards collective arts-making processes, rather than artists working alone. It was noted that musicians in particular need increased awareness of the society and media, which is until now missing in the conservatoire studies compared to the way they are addressed in other disciplines of arts. I think I have widened my artistic vision. […] I think there is also an opportunity to create an interactive space to show my performances. And to engage with people during a live performance through for example Twitter. The artist talks were held first thing each morning, and after that the students worked in groups on field trips and creative labs. There was also a tech-lab hosted by Lex van der Broek, where ideas could be tried out on a practical and a technical level. The tech-lab raised genuine interest in technology from the students. It proved to be an excellent extension to the artistic work and a very important point of departure for the students to get on with technological knowhow in their projects. In Iceland, I discovered new techniques and new dimensions to make music different of which I have been used to do in the past. I’m educated and used to make music analogously, but I have the curiosity to learn and to explore new possibilities; the possibilities of playing and working together in a virtual way and understanding the electronics basics to be able to use it in our performance. The discussion also addressed ethical questions that were raised regarding the danger that any kind of online innovation can easily become exploited. I will work to avoid creating art that feels like art for artists. I aim to point out flaws in society and highlight hidden strengths. I hope to never have my name on a piece or in a concert where I feel that I am continuing to strengthen systemically driven differences between people. It made it concrete for me that it is of extreme importance to connect with the individuals I am representing before, during, and after the making of a piece. I have understood the importance of being open to new forms of art and how coming out of my comfort zone has helped me to become a more versatile musician by being able to perform different kinds of music. […] With this new knowledge, I hope to spread this awareness of digital music to fellow “classical” musicians and that by doing so, they will also be inspired by this and be open to come out of their comfort zone as well to experience this whole new dimension of music. Not just stick to “classical” performance practices in this ever-changing society. The daily reflection sessions with the students revealed that students were especially inspired by the artist presentations during the intensive days in Iceland, which helped to inform and kick-off the group work process. In fact, the format, where the students could immediately try new ideas out right after the presentations was regarded highly. Also, they showed awareness of the collaborative nature of the course and stressed a need for sharing knowledge and responsibility in the group work. The group work was considered as an opportunity to connect deeply and genuinely with the other members in a supported environment. The students voiced that they felt that they gained a new sense of agency in regards creating arts online, but also critical awareness of the banality of the internet in our lives. In fact, the internet itself was not considered as a relevant point of departure for the course work, but instead, focusing on creating arts by using digital media resonated with the students on a deeper level. The students came to realise that “internet art” can be made offline as well, as a form of social commentary on the post-internet era. The intensive days for the second course were held in Groningen, curated by Krista de Wit. There were two main guest speakers: Net-artist Jonas Lund discussed some of his recent works, juxtaposed with his observations of the current ongoing and changing political, social and technological climate online. Audiovisual artist Marcel Wierickx presented his recent work as composer for contemporary dance and discussed his techniques for audiovisual music performance. He demonstrated how creative system design can be approached as an artistic discipline. Marcel Wierickx presenting his work to the students at the 2018 Blended Mobility course. Apart from the presentations from the guests, Niels Vermeulen led his ongoing creative lab, The Unexpected System, and Karst de Jong led an improvisation session. Lex van Broek gave a presentation on “Sensing and driving the physical world using sensors and actuators” and Krista de Wit gave a presentation on the Blended mobility course, the general approaches of the course and its blended learning pedagogy. Students who are working on music- and art-projects need microphones, recorders and cameras to realize their ideas and to document (record) their experiments and performances. For a lot of students, it is not an option to buy these (mostly expensive) items, so they are depended of the technology that is available in their school. It seems that not every school has the same type of support if it comes down to a/v technology. If students want to design an (inter)active installation or an electronic music interface, they need assistance from technicians to enter the world of digital and analogue electronics. How do you communicate with a computer? How can I have my computer change the speed of a small dc-motor? Can I build my own modular synthesizer? Which microphone do I need to record a violin? These are just a few examples of student questions that need to be answered. During the recent sessions, it has become clearer that the ‘Innovative’ and ‘New Audiences’ artist is often dependent of technology and tech-support. If you enter the world of communication, whether it is a microphone, a speaker or an internet-connection, there is always need for equipment or support. Besides the tech-knowhow, the students also need a place (workshop) to experiment and solder new circuits or modify and hack existing circuits. Students need this kind of tech support in order to create their own art. Lex van der Broek giving his technical presentation to students in Groningen in March 2018. The most poignant learning experience for me was a confirmation of my desire to use technology integrated in my work, but only in small touches and where necessary, as amplification or an aid to my practice but not as a core aspect. Through reflecting on this reality, I have been able to plan more efficiently my current and future projects, allowing space for a specialist to take care of certain aspects of the process instead of taking everything onto myself. One general note that came out at the end of the intensive days was the question of definition and emphases on online learning vs. internet art and audience engagement. Audience participation and creative online arts practices can have a less formal set-up for learning than a traditional e-learning context, although learning undoubtedly takes place in all online communities (as explained earlier by Waldron, 2018). In the context of this module, it needs to be said that we are not implying “teaching in the online space” per se, but “learning through creative collaboration online”. It needs to be spelled out that this course was student-driven, based on the relevance of the online projects for them as collaborative agents, and therefore, the group work had a central positioning in the design of the module. I hope to be able to make music with more people from all over the world and collaborate with them, and also to share my music on different social media platforms so that I can continue to inspire the next generation and to also be inspired by fellow artists. From an educational perspective, however, the artist talks took a specific interactive form of online education. For example, during the presentation of Jonas Lund, the group of students and teachers were “inside his computer” as he took us through his work on his own screen. This allowed a very proximal, personal and real-time contact with the speaker and gave access into his way of “thinking within his computer”, that can be missing in other formal webinars or Skype-conferences. Therefore, the combination of student-led project work and interactive artist talks facilitated a very distinct closeness of collaborative learning in the blended learning settings. For me, the purpose to apply for this course, the main reason was to answer my curiosity: how can this blended mobility course combine music and art? ; how can we use the strategies of digital tools for artistic work online? ; how can technology support arts online? ; how does online learning, especially musical learning connect with the world wide web without disturbance? During the three days intensive learning, what impressed me the most and what I experienced was that I noticed that anything is possible if you want and dare to put your idea onto the internet. Being “inside” Jonas Lund’s computer during intensive days in Groningen, March 2018.